The Blackmagic Pocket Cinema Camera 4k was the talk of the show when it was unveiled at NAB 2018 in April, and the excitement over this impressive camera has hardly subsided. The Pocket Cinema Camera 4k is Blackmagic’s successor to their original Blackmagic Pocket Cinema Camera; however, one would be hard pressed to find similarities. The Pocket 4k has a radically different design, is significantly larger in size and boasts a host of new features and capabilities compared to its predecessor. Contrary to its name, the Pocket Cinema Camera 4k is no “pocket camera”. Still, for a cinema camera that shoots RAW and ProRes HQ in 4K DCI 60p without spontaneously combusting, I think we can cut Blackmagic some slack here – it’s about as compact as it can be. Although the Pocket 4k is larger than many DSLR cameras (particularly in width), the camera body is made of carbon fiber composite so is surprisingly lightweight (weighing in at 1.59lbs/720g). The camera feels great to hand hold, with a large grip on the right side that makes the system strong and sturdy. On the top of the camera body there are three function buttons that are fully customizable, along with three other buttons pre-assigned to ISO, Shutter and White Balance. Still frames can be taken with the still button and there is an iris wheel with a push function for zoom in focus assist. It is important to note however that the Pocket Cinema Camera 4k was designed for just that: cinema, not stills. Menu design is one aspect where Blackmagic stands out among the crowd. With so many cameras having a menu system that is confusing, immensely extensive, and hard to use, we were happy to see that the interface for the Pocket 4K was as simple and effective as possible. Using nearly the same interface as Blackmagic’s URSA Mini Pro, the multitouch interface on the Pocket 4k is so user friendly and straight forward that you would never even need to open a manual. 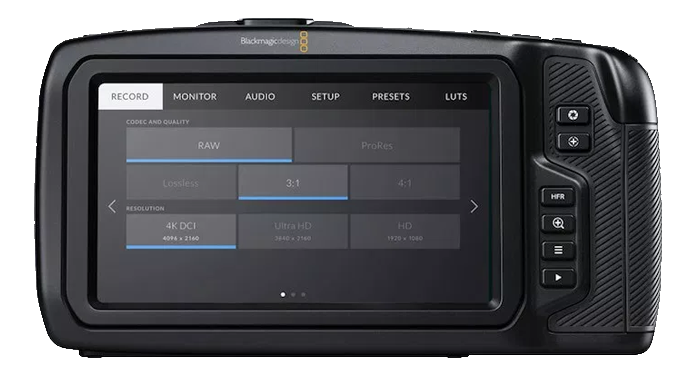 The menu interface on this camera really separates the Pocket 4k from other mirrorless cameras and the fact that the Pocket 4K is solely designed for video allowed Blackmagic to remove the added clutter that comes with multi-purpose cameras. Holding true to the original Pocket Cinema Camera, the Pocket Cinema Camera 4K offers no viewfinder. Instead of an EVF, you get a gorgeous 5” multitouch HD monitor built right into the back. The LCD is 1080p with excellent color representation and sharp imaging that allows you to easily judge focus. Overall the screen is very nice and wonderfully responsive to any input. The Pocket Cinema Camera 4K uses Canon LP-E6 type batteries. This is convenient for Canon shooters, as you can continue using your old batteries from Canon cameras like the 5D Mark II and III. Multiple batteries are a necessity, as the Pocket 4K drains battery fast. Blackmagic claims a battery life of 60 minutes...in reality, you can get about 30-45 minutes, depending on your usage. It is recommended to use an additional external battery source and power the camera off when not recording. A 2-pin locking AC power cable comes with the camera and is used to charge the batteries – so in practice, the camera is the charger. Another improvement to the original Pocket Cinema Camera is the larger sensor size. As compared to the smaller Super 16mm sized sensor of the original Pocket Cinema Camera, the new Pocket 4K incorporates a Micro Four Thirds 18.96 x 10.00 mm sensor with Dual Native ISO of 400 and 3200. When it comes to low light, the Pocket 4K is far improved from the original Pocket camera and better than a lot of other cameras on the market. An official dynamic range test was done and conservatively showed that the Pocket 4K has 11.6 stops of dynamic range. This is quite impressive considering the Sony A7SII and Panasonic GH5-S (two of the most popular mirrorless cameras on the market for video) showed dynamic ranges of only 10.6 and 10.7 stops, respectively. The Pocket 4K uses a Micro Four Thirds mount, which is arguably the most adaptable lens mount on the market. With various adapters available, practically any lens can be used with this camera. If you are still wondering what all the rave is about over the Pocket Cinema Camera 4K, you’ll find your answer here. Firstly, having ProRes as the main codec allows for simplified editing and eliminates the need for computer intensive formats that require transcoding and rendering. Although recording RAW and ProRes requires a lot of memory storage, the image quality and the amount of data captured so quickly is much preferred over the highly compressed codecs that most other manufacturers use. You’ll be hard pressed to find another camera that records 12-bit RAW internally for less than $1,300 – in fact, the Pocket 4K is the least expensive ProRes 4K capable camera on the market. Yes, the Pocket 4K shoots full quality 4K up to 60fps and 120fps at 1080p with a dedicated “sensor crop” button. On top of all that, the Pocket Cinema Camera 4K comes included with DaVinci Resolve Studio and an activation key so you can start editing right away. 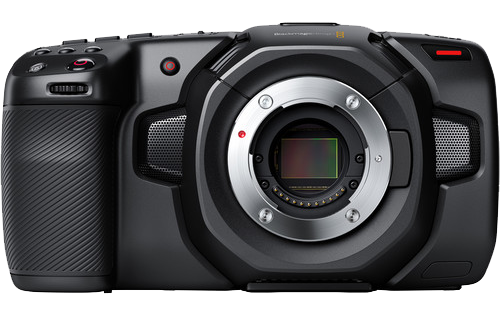 The Blackmagic Pocket Cinema Camera 4K promises to be a desirable video camera for underwater use. The 5” screen means there is no need for an external monitor and the price point is so low that it makes it much more affordable compared to other high-end underwater video systems. Also, the micro four thirds mount allows you to use your other micro four thirds mount lenses with the Pocket 4K system so you won’t have to purchase additional lenses for underwater video. It may be difficult to navigate the menu system with an underwater housing, since it is primarily touch-screen controlled but we will see how Nauticam and the other underwater housing manufacturers maneuver this problem. 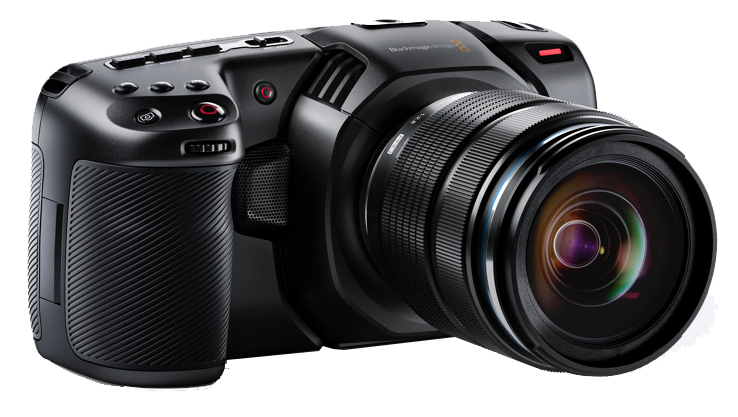 It goes without saying that the Blackmagic Pocket Cinema Camera 4K is innovative and exciting. This little camera definitely packs a punch and lives up to its reputation as a “disruptor camera”. The design is sleek and portable, the image quality is beautiful, the dynamic range is highly competitive to other cinema cameras, the interface is straightforward and finally, the price point is low. The Pocket 4K is not perfect of course but for only $1,299 this little camera is a beast! 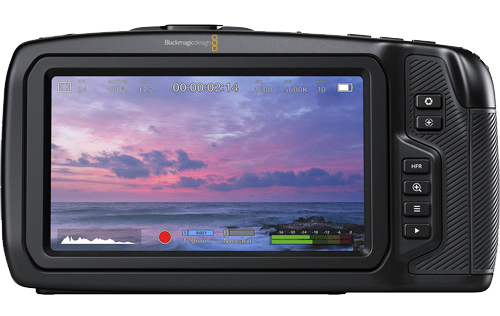 As usual we expect all the top housing manufacturers to create a housing for the Blackmagic Pocket Cinema Camera 4K. Nauticam has announced that they are working on a housing and it will be released in early 2019. 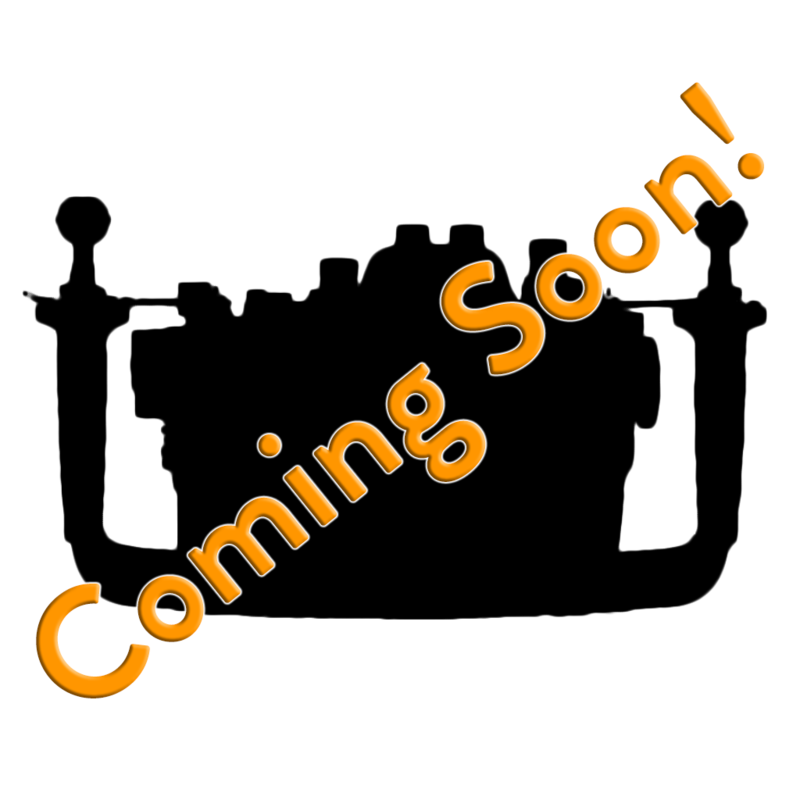 Check back for updated information as soon as we have it and a full underwater video review when the housing is released!